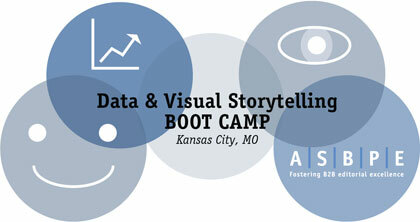 Join the Kansas City chapter on February 28th for a data and visual storytelling boot camp. Registration, networking and breakfast will begin at 8:00 am. Sessions will run from 8:30 to noon. February 28th, 2017, 8 a.m.-12 p.m. The first step in great data presentation is effective data gathering. This workshop will help you figure out the kind of data you want, the demographics you need to gather to drill down into your responses for analysis, what power questions to include and how to evaluate the questions you’re thinking of asking to maximize the accuracy of the final data set. Are you a bit of a Map Geek? Want to put finally put that Geography minor to good use? Or do you want to learn how to use maps to provide your online and print audiences with demographic info or other data on the local metro, county or state level? This workshop will teach you how to use the free Google Fusion mapping tool to display data such as population, employment, sales, housing starts, types of companies and other info in an interactive mapping format that looks great in a digital format and isn’t hard to master. 3) and tips for curating the best content to include in your doodle. You’ve got the data. You know your demographic. Your creativity is rearing to go. What now? This session will educate you on how to weave that data into a compelling story, determining the best vehicle to launch that story and what to do after you set sail toward keeping them hooked. Marnette Falley is the Content Director for UBM Life Sciences’ veterinary group. The editorial team she heads develops multimedia content for three national conferences, the veterinary market’s leading web portal, and three award-winning print publications — dvm360 magazine, Firstline and Vetted. The team also produces eletters, outside projects for corporate clients, custom web sites, webinars, and more. Falley was recognized as a McAllister Editorial Fellow for her editorial leadership. She holds a Bachelor’s Degree in Spanish and Political Science from Kansas State University and a Master’s Degree from the William Allen White School of Journalism and Mass Communications at the University of Kansas. She lives west of Kansas City in a little farm house that she shares with her husband, daughter and a Chocolate Lab named Chip. Portia Stewart is Editor and Team Channel Director for UBM Life Sciences’ veterinary group. She is a pun-loving editor who spends her days arguing the differences between cats and commas (commas are a pause at the end of a clause, while cats have the claws at the end of the paws). She is a minion to two cats, a dog and a guinea pig. She’s also the mastermind behind the practical articles, tools, videos, and solutions for managers, technicians, assistants, and veterinary receptionists that you find on dvm360.com. Alison Fulton is currently Design Director at Farm Journal Media where she is working on three different magazines and helping expedite the move to digital content. Alison was previously at UBM Life Sciences, Veterinary (formerly Advanstar Veterinary) where she was privileged to work with the best team imaginable for over 20 years. Alison designs and creates magazines, iPad apps, emails and websites amongst other things; data presentation over all platforms is one of her specialties. She and her husband Jeff, have two beloved dogs, Beau, a fuzzy brown and Elsa, a (black and white) Dalmatian. Katie James is an Associate Content Specialist for UBM Life Sciences, Veterinary. She produces and edits content for dvm360.com and its associated print publications, dvm360 magazine, Vetted and Firstline. She has a passion for creating highly-engaging content through the use of new technology and storytelling platforms. She was named an ASBPE Young Leader Scholar in 2015 and attended the national conference in New York. Katie grew up in the Kansas City area and graduated from the University of Kansas with a degree in journalism. Outside of the office her sidekick is an energetic Australian cattle dog mix named Blitz. Marc Vasquez, APR, is the Security Awareness Program Manager for UMB Financial Corporation where. He possesses nearly 20 years of both agency and corporate public relations and social media experience. Marc is also the technology chair for the Social Media Club of Kansas City and is a member of the Social Media Club global board. He holds the Accreditation in Public Relations credential which has been established as a way to recognize public relations practitioners who have mastered the knowledge, skills and abilities needed to develop and deliver strategic communications. By night is the gaming sidekick to his 9-year-old son @StuffJakobSays. You can generally find Marc via @vasquez007 or on LinkedIn.